Before you buy air purifier Omaha, talk to us. For 15 years Snell Heating and Air Conditioning has provided prompt and professional air cleaner installation, service and repair to residential and commercial customers in Omaha, Elkhorn, Gretna, Bellevue and northeast Nebraska. 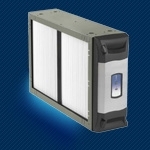 Our whole home electric air filtration system removes icky pollutants from the air. Breathe cleaner air. Ideal for allergy/asthma sufferers, our exceptional air cleaner removes 99% of microscopic impurities like Influenza A, B C, Swine & Avian viruses, pollen, dust, mold spores & cat dander – gone. You will also benefit from a home humidifier system to keep skin moist. When you buy air purifier in Omaha from us, rest easy. Manufacturer studies show our air purification systems exponentially outperform HEPA and iconic units. Easily vacuum the reusable filter. System attaches to furnace or air handler.